Monty Manatee Weddings – Tips And Advice for Planning Your Big Day! So you’re engaged! Congratulations and…now what? Perhaps you’re an event planning expert with years of experience. Or maybe you’ve never planned so much as an evening out to dinner. Either way, these tips will give you the basic idea you need to get started on organizing one of the most important days of your life. Wedding on! Step 1: Tell your family and friends. For the love of weddings, please make sure your people find out from you and not social media! They have walked with you through life and deserve to know about this all important happening first. Yes, before you even set a date. If you don’t know what you’re spending and not spending, it’s pretty difficult to begin anything. So sit down, grab a calculator, and crunch those numbers! Step 3: NOW set a date. After these first things, you have permission to pick the date for the big day. Ensure that you have adequate time to plan all the details, and you give notice to out of town guests. Step 4: The all- important timeline. Without a timeline, you are a boat with no sails, a book with no writing, a…you get the idea. Devote a day to putting everything in order and marking your calendar. Step 5: Engagement party (if you have one). This is not a necessary step, but a lot of people like to have them. Usually, the family will help out with paying for an engagement event. The guest list includes close family members and personal friends. Do not feel obligated to invite everyone who is coming to the wedding! Engagement parties are on a much smaller, intimate scale. Step 6: Pick your wedding party. And find a cool way to ask them, too! This is a special time for your friends, too, and they will remember how you popped the question to them. Think about how many people you are inviting, the atmosphere you want, and what time of day. Research some options and visit locations until you find a place that works well. Yes, dress before anything else! Why? Because dresses take months to come in, and then usually need to be altered, which takes more time. The sooner you find one, the better! This is getting serious now – we’re on to invites! These need to be picked out and ordered well in advance, so people can book flights, plan to take off work, or whatever they need to do. 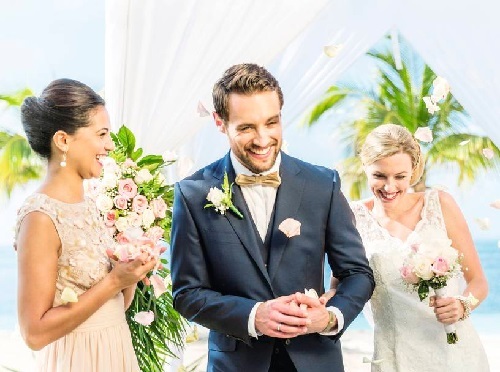 Typically, you should send out the invitations at least 4 months in advance, then keep in touch with guests through one of those handy websites. Get your buddies outfitted for the big day, and ensure adequate time for alterations for their threads, too! This should be done around the time you book your venue and get the dress. Caterers schedules fill up quickly. Ask other married friends who they would recommend, call around, and find a great price with someone you trust to handle your day. A good deejay will know the current songs to play, as well as old favorites, have great reviews, and also be able to act as an MC for the party. Do a run through with them and give them a paper with the order of events, announcements, and songs to play. You should book this at the same time as your caterer. Use Pinterest, magazines, or whatever inspires you to help you choose your colors and décor for the day. Think if you will need curtains, lights, centerpieces, etc. A lot of caterers or venues will offer some decorations with the price, such as table linens or flowers. Make certain this is done several months out. If you choose to include bouquets and boutonnieres in your wedding, order them at least 6 months out. Like many others, florists have busy schedules, especially for wedding weekends. You can often get a blanket price that will include many different elements for your flowers. Step 16: Buy the diamond engagement rings. Getting an engagement ring for a proposal in advance will help you save unnecessary stress. You will need to factor in extra time for resizing, delivery and customizing a ring. If you need specialized help in this area, check out this engagement ring blog run by Paul Gian. Step 17: Get the wedding rings ordered. Generally, your groom will take care of this, but a little reminder about 6 months before the big day doesn’t hurt. Step 18: Plan your honeymoon. 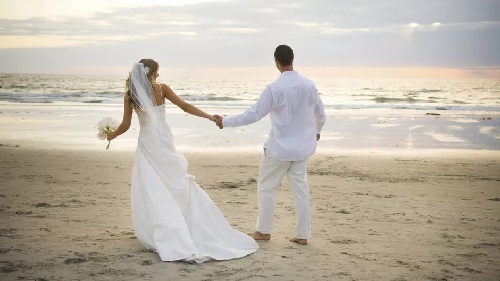 It may seem far away now, but the closer you get to your wedding day, the less time you will have to plan, so start early booking flights, cruises, hotel rooms, etc. It is your honeymoon, so include some extras to make it special! So there you have it! Make sure to read when each task should be accomplished, as some things need to be done earlier, or at the same time as others. Have fun planning the day of your dreams! Howdy, my name's Elaine and I created this blog to offer insights and tips for planning your wedding.